"Fired from her most recent governess position, Melanie Ross must embrace her last resort: the Arizona mercantile she inherited from her cousin. But Caleb Nelson is positive he inherited the mercantile, and he's not about to let some obstinate woman with newfangled ideas mess up all he's worked for. He's determined to get Melanie married off as soon as possible, and luckily there are plenty of single men in town quite interested in taking her off his hands.The problem is, Caleb soon realizes he doesn't want her to marry up with any of them. He's drawn to Melanie more every day, and he has to admit some of her ideas for the store unexpectedly offer positive results. Melanie Ross finds herself in a dire situation that forces her to pick up roots and travel west in search of a new life. Finding herself at her cousin’s mercantile store that he left his share of in his will, in Cedar Ridge, she butts head with the current co-owner, Caleb and from there, friction ensues. With suspicious deaths, angry notes and malicious threats thrown at them in their little community, will they have the strength and faith to see each other through? 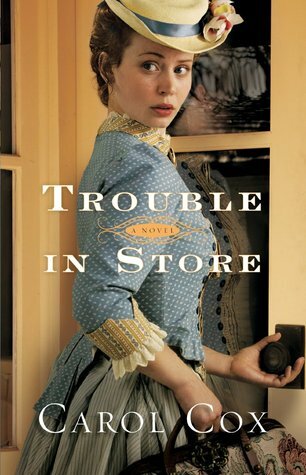 I found Trouble in Store to be a very delightful light read that kept me immersed from the beginning to the end. the book’s plot and lovely descriptive elements kept a steady pace of adventure and mystery which kept my interest. It had a great flow that kept me wanting to read on with intrigue, suspense and the possibility of a blooming romance. I became quite attached to that little mercantile store and could envision it as if it were my own local shop. You could feel the Arizona heat and sun rays filter through the display window as you walked around the store filled with the different items that told the life stories of the inhabitants of Cedar Ridge. As the mysterious, and fretful, incidents occur throughout the book, I felt the range of emotions along with Melanie and Caleb as they fought to discover the perpetrator, each other and even themselves. Melanie’s desperation in receiving approval and finding a place to truly call home, and Caleb’s desperation to find a will to move from grief and make a life for him and his son are truly put to the test. Trouble in Store shows the strength of self-discovery and how keeping faith in your love ones and friends, as well as the Lord, will prevail over all.